The basic framework of the EB-5 regulations requires that an investor make an “equity” investment into a qualifying EB-5 program. A loan to a project with a guarantee of repayment does not suffice. This has not always been the case, however. When the program was first implemented, it was common for investors to invest with a cash down and a portion in the form of “promissory notes”. The USCIS did away with that and has since made it clear that a loan is not an investment. This is because the investor is not making a loan to the project, but rather an equity investment in a limited partnership created by the Regional Center, which then in turn makes a loan to the EB-5 project. At this juncture, a diagram would be helpful. An “Equity Model” investment has a completely different structure. There, the individual investor takes an equity position in the project itself. This is what an individual investor who makes an EB-5 investment into his or her own project in a so-called “direct EB-5” or “stand-alone EB-5” (which basically means no Regional Center is involved) will be doing. What are the pros and cons to each model? 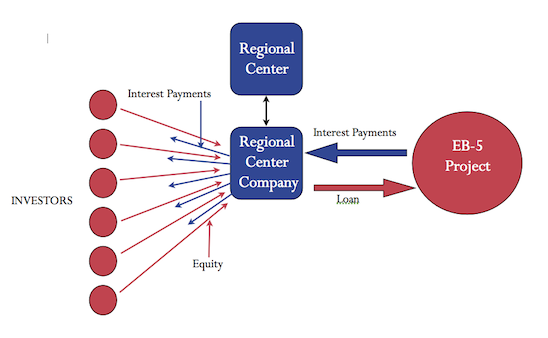 Theoretically, one can’t say one is better than the other, although the majority of Regional Center projects out there today employ the “loan-model” in their projects. The reasons for this are rather simple: the investor knows with relative certainty the mode and timing of the exit (i.e. repayment of the loan by the borrower at the end of the term of the loan). In an equity-model, after the investor successfully obtains a permanent greencard, the exit will depend on market conditions – if the market for whatever the equity interest is good, you should sell, if not good, you should hold. As a result, I know of people who invested in equity model EB-5s a long time ago who forgot about it and then were rewarded with a sizable profit after many years, almost doubling their principal. Some people didn’t or couldn’t wait for the market to improve so they sold early and as a result couldn’t recover all of their principal.